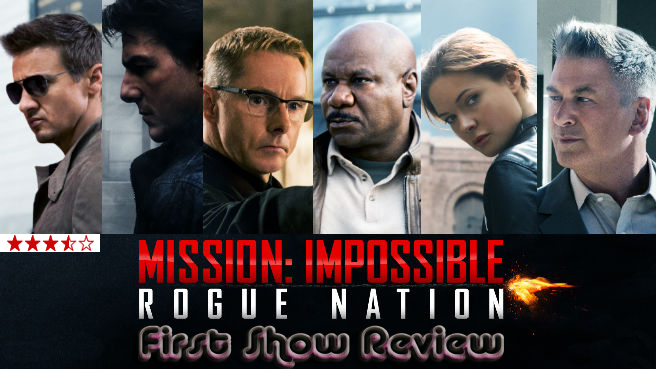 After one week of world wide release ‘Mission Imposiible : Rogue Nation’ (MI:5) reached India yesterday.At last they changed the storyline other than a chemical or nuclear territory, now Mission Impossible came with a different one. It’s been 19 years since the first Mission: Impossible, and that scene of Cruise’s life hanging by a drop of sweat in it is still vivid in our memory. Or the first moment when a mask is pulled off and Cruise emerges from below it. Even the last film, Ghost Protocol, pulled off a near-impossible Burj Khalifa shot apart from giving us some heart-popping moments of suspense through certain tight negotiations. You will miss that in Rogue Nation, though it ticks all the boxes, gives its woman a satisfyingly meaty presence, and has Cruise defying age again, apart from death of course. After intercepting nerve gas being sold to Australian terrorists, Impossible Mission Force agent Ethan Hunt (Tom Cruise) is convinced he can prove the existence of the Syndicate, an international criminal consortium. Reporting to an IMF substation to receive his next orders, Hunt is captured by the Syndicate, but escapes a torture chamber led by Syndicate member Janik "Bone Doctor" Vinter (Jens Hultén) with the help of disavowed MI6 agent and Syndicate operative Ilsa Faust (Rebecca Ferguson). Meanwhile, CIA director Alan Hunley (Alec Baldwin) and IMF agent William Brandt (Jeremy Renner) appear before a Senate oversight committee, and Hunley succeeds in having the IMF disbanded and absorbed into the CIA, guaranteeing that Hunt will be captured within the day. Cut off from the IMF, Hunt starts following his only lead: a blond man in glasses, later identified as Solomon Lane (Sean Harris). Faust returns to London, and attempts to pass the file to her handler, Attlee (Simon McBurney), who compels her to return to the Syndicate and finish her mission. She returns to Lane, only to find that Attlee has wiped the drive, which in fact contained an encrypted, British-government “red box” that requires the Prime Minister's biometrics in order to be unlocked. The former IMF agents confront Faust, but when Lane's men abduct Dunn, they are told they must deliver a decrypted copy of the drive to Lane. Despite the objections of the others, Hunt realizes Lane will always have a plan to acquire the files; believing the only certain way to stop him is to confront him, Hunt agrees to the ultimatum.